Armstrong was the real deal in 1993. As it is a wet and windy day I turned to my stack of old video tapes for my cycling entertainment. I found a tape from 1993 of a very nice win in de Ronde by Johan Museeuw. 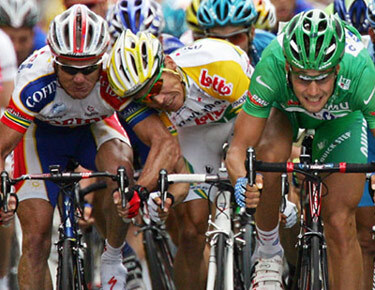 On the same tape was that year’s Milan-San Remo, not a favourite race but worth a look. The winner was Maurizio Fondriest who clipped off over the top of the Poggio and won alone. What impressed me though was not Fondriest, who as a former world champion could be expected to shine, but Lance Armstrong who was very active in the finale. At the time Armstrong was just 21 years old and had little experience of racing at the top level. The Texan launched a massive attack over the top of the Cipressa with 270km covered but he was pulled back yet he was still active in the chase of Fondriest. There was a massive crash when the chasing group, sprinting seconds after the winner, hit the back of the official car that had stopped just after the line! Given this demonstration of Armstrong’s ability perhaps I shouldn’t have been too surprised when he snatched the world title from hot favourite Museeuw later in the year to become the youngest ever pro champion. A total of 223,000 gallons of water was used at Lance Armstrong’s home in June 2008 according to the most recent city records available. That’s about what 26 average Austin households use in a month. At a time when rainfall has been scarce and the city has imposed mandatory water restrictions, Armstrong is not the only Austinite using a lot of water. Armstrong, who had been in California for part of the month said that the electric bills seemed high when he moved in several years ago but that high water usage had not been called to his attention. His finances, including bills, are handled by a management company. In June, his water bill, which does not include wastewater or other utilities, was $1,630.23, according to Austin Water Utility. Hammond recently told Times reporter Brendan Gallagher that “If Armstrong could win the Tour in this day and age it would clarify that he won his Tours clean.” He must be joking. Armstrong beat a doped peloton for seven years and I do not doubt that he could be a serious contender, or even win, a clean Tour. But so what. How does winning clean in 2009 prove that Armstrong was clean in 1999-2006? There is a mass of evidence that Armstrong doped and against that is the fact that he never failed a dope test. Just like Marion Jones or Ivan Basso or Ivan Basso’s dog or Johan Museeuw or Eric Zabel or Aldag or Bjarne Riis and hundreds of others who never failed a test but we now know were dopers. Get real Roger, whatever happens in 2009 will have no bearing on the dark days of the first Armstrong era. That nasty crash in Gent-Wevelgem must have shook Roger’s brain. Nothing is made to last these days. Fortunately I was just one mile from home when my saddle came loose today. 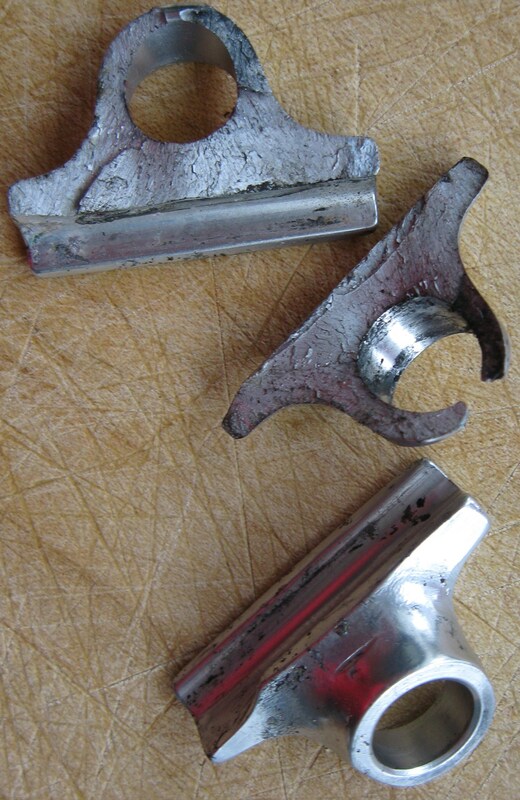 I heard something fall to the ground and was amazed to see that the cradle of my Campagnolo seat pin had broken in two. I paid two quid for that luxury item back in 1963 and I expected it to last for longer than fortyfive years. Not to worry I have another in my spares box that has seen little use so it should see me out. Not everyone was happy with the confirmation that the Olympic mountain bike races will be held on a course at Hadleigh Farm in Essex. The Welsh Minister for Heritage, Alun Ffred Jones, commented, “I’m disappointed that London 2012 hasn’t looked beyond Essex, one of England’s flattest counties, for venues for the mountain biking events during the 2012 Games. Whilst this new course may meet the technical requirements for the competition, one thing we do have in Wales is plenty of mountains and some truly world-class mountain bike courses. This was an opportunity for LOCOG to show in a concrete way how serious they are about spreading the benefits of the 2012 Games beyond the south east of England. That opportunity has now been missed.” Yea right, Alun Ffred, some opportunity. If we must have the bloody Olympics in Llondon why would we have the mountain biking in Wales? Ffu*# Off you dope. Fourteen years is a long time for a “top road sprinter” to race without winning a classsic but that has been the fate of Rocketman Robbie. 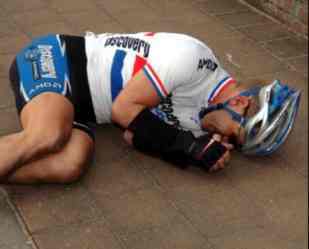 And the reason, of course, is that he falls apart if the race goes much over 200km. Give him a flat 180km Tour stage and he is a top fella but send him up the Bosberg after 250km and it is time for an early bath. OK he did get round the Worlds at Zolder but did you see the course? It was stupidly easy, the UCI must have wanted to give Cipo a present. I should also mention his four wins in Paris-Brussels which used to be a serious classic back in Brik Schotte’s day but is now a consolation race. I suppose I should also mention his win in the Scheldeprijs which is a nice race but hardly a severe test. Now Robbie has now won the Hamburg “Classic”, but in what sense is it a classic? In no sense at all, and the organisers realised it and reduced their little race to 213km and lo and behold Robbie pops up and wins it. My recurring nightmare is that Cav never makes the big leap to being a Classic winner and has a career like Robbie’s stuffed full of stage wins, Points jerseys and criteriums. Strenuous physical training to boost performance depletes the body of water, electrolytes (sodium and potassium) and minerals (magnesium, calcium, zinc) through sweating, uses up stored sugar or glycogen in muscles, and breaks down muscle. The ability to replenish these nutrients and rebuild muscle is fundamental to a racer’s ability to train hard every day and succeed in competition. Low-fat milk may be a better choice than sports drinks or soy protein beverages for replacing lost fluids after endurance exercise and for helping to repair and rebuild muscles after strength training. A study showed that, after exhaustive exercise, athletes who drank low-fat milk, compared to those who drank water or a commercial sports drink, retained substantially more of the fluid consumed during a two hour recovery period. Thus, low-fat milk promotes retention of fluid after heavy exercise. Other studies have shown that low-fat or fat-free milk, compared to a soy protein beverage, is an ideal choice for muscle repair and muscle gain after strenuous weight lifting. After one session of weight-lifting and twelve weeks of training, consumption of milk increased muscle building and the overall gain of muscle more than the other drinks. The reason for the advantage of milk over the other products may be related to the nutritional content of milk and how the nutrients work together to enable recovery after heavy exercise. Low-fat milk is a nutritional power house. It consists of 90% water, so it is a good source to replace fluid lost in sweat. Low-fat milk also contains calcium, phosphorus and vitamin D to build strong bones, and B vitamins to produce energy. A pint of low-fat milk provide substantial amounts of potassium and sodium, both of which are lost in sweat during exercise. Low-fat milk also is an important source of the key proteins, whey and casein, which contain leucine, an amino acid (building-block) needed to make new protein. Whey is absorbed very quickly and coordinates the process of building muscle protein. Casein plays another essential role by slowing the breakdown of muscle after exercise. Sugar content of low-fat milk also is high. Low-fat chocolate milk offers additional benefits because it has a greater carbohydrate or sugar content than low-fat milk with slightly more fat. The principal carbohydrate in cow’s milk is lactose or milk sugar. Low-fat chocolate milk contains carbohydrate and protein in a proportion greater than 3 to 1, which is the optimal level to refuel tired muscles with carbohydrate after heavy exercise. The presence of protein in milk is vital because it speeds the uptake of sugar into exhausted muscles by directly increasing insulin levels in blood. A study found that men who drank low-fat chocolate milk during the 2-hour recovery period after one bout of strenuous exercise improved their time to exhaustion by 52% in a second consecutive exercise test as compared to some commercial sports drinks. This important finding, although preliminary, suggests that low-fat chocolate milk can be useful in assisting people to recover from one session of strenuous exercise to the next. Compared to other after-exercise recovery beverages, low-fat chocolate milk provides needed nutrients to refill body fluids, replenish muscle energy stores, and rebuild and renew tired muscles. Additional research is underway to confirm and extend the findings that low-fat chocolate milk is an effective after-exercise beverage for adults engaged in all types of physical activity.